Like a Champagne diamond hidden under other precious gems in a jewelry box, Tasmania is one of the most intriguing parts of Australia. Tassie, as it is affectionately known, is Australia’s smallest and most southerly state. About the size of the state of Virginia, it is the place to go for a stunning foray into nature, for over half the island is wilderness, about 20% of which is made up of UNESCO World Heritage protected parks. What is not wild, is a sprinkling of farms, forests and towns — green and neat and quaint — a little like Olde England. The English settled Tasmania in the 18th century and, as many people do when they emigrate, they tried to make their new home much like their original. However, most visitors head to Tassie for the 3,000 kilometers of walking tracks, hundreds of mountains, valleys, highland lakes and glacial tarns that beckon the jaded “cityslicker” family to get unslicked and slack off. Clean beaches, caves, large and small islands both remote and accessible, forests, rivers and wildlife including several mammals that are now extinct on the Australian continent, all create the perfect ingredients for a family holiday. Getting there is usually by ferry or plane, so it was the good ship, Spirit of Tasmania, that bobbed (or rather heaved) away from the mainland and into Bass Strait, a strip of turbulent sea separating Tassie from the rest of Australia. Once joined to the mainland before the last ice-age, its isolation has allowed unique animals and plants to thrive. Seen as a remote part of Australia not worth bothering about until now, development has been very slow in arriving on the island, fortunately allowing a modern sense of preservation to arrive at the same time. This has created a place that honors its heritage and unspoilt areas (apart from a few dodgy logging practises) yet offers the comfort and convenience of modern life. All this is before us as I quickly tuck myself into a cabin bunk on the Spirit, in the vague hope that lying down will help any possible seasickness. It does, even when Mister 3-year-old — too excited to lay calmly in the portable cot — climbs onto the window sill to pull back the curtains and squeal at the darkening sea and sky. Getting up to settle him does not bring on the woeful feelings of illness. In fact, the only reminder we are actually moving comes from the throbbing of the engines. Stepping off into the nondescript town of Devonport does nothing to introduce the stunning mix of attractions available. The plan is to head south then work our way northward. Hobart, the capital of Tassie, a city of 203,000, is located in the south and guarded by the local mountain, Mt. Wellington, looming to the west. The first thing to do is to take the winding road up Mt. Wellie (Aussies shorten every word) to its peak at 4,000 feet, where panoramic vistas of river, mountain and sea spread out in all directions. The main shopping event of each week is Salamanca Market, a busy, bustling gathering of people browsing stalls displaying one of the island’s arts and crafts. Wools, skins, furs, leathers, felts, silks, cottons and suedes ripple across our vision; samples of fudge and homemade jams coats our tongues and the eclectic music of buskers surround us. However, we came to Tassie to get into nature and soon head even further south to explore the picturesque Huon Valley. Named after the native Huon Pine, a wide lazy river flows through green hills along which we find the only wooden boat-building center in the country. What is it about handcrafted wooden boats? They call to our relaxed, romantic nature with their solid, earthy textures and simple curves. Somehow, they belong here on the Huon, a place of trees and waters, stone houses and quiet riverside villages. Plastic boats just look out of place. However children can’t be held by looking at boats, rivers and landscapes for too long so we end up underground at the Hastings Caves (+61 (0)3 6298 3209) where what we think is a small cave, turns out to be a huge cavern, revealing treasures as the guide presses a switch. Slowly, a series of lights turn on, revealing stalactites, stalagmites and columns of glittering wet dolomite. ‘Wedding cakes’, ‘shawls’ and ‘straws’ appear in a strange, silent, cold world defying the warm, living rainforest above. Back in Hobart we sleep in to make sure we are all awake for the bloodstained heritage of the Convict Era. 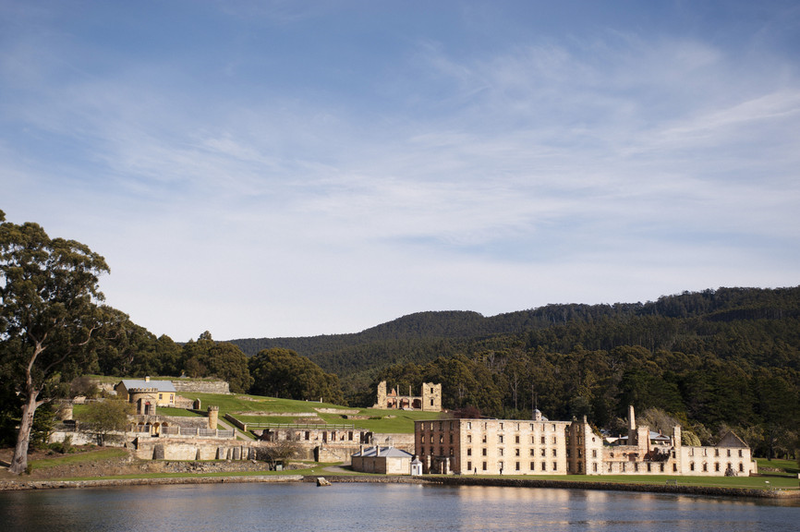 Port Arthur was the prison where naughty convicts ended up when they stuffed up in Van Diemens Land, as it was known in the 1800’s. Not as depressing as I had imagined, and surprisingly an interesting family outing. I found it fascinating to delve into the unique lives of 18th-century people transported from a very different homeland halfway around the world to a rugged, wild and alien country. Port Arthur has kept its punishment cells, workshops, cottages and even a graveyard on the Isle of the Dead in excellent condition without sacrificing the necessary ‘ruined’ look. There are Ghost Tours presented at night that, yes, left me with a haunted feeling. “I’ve returned for a second look,” whispered my neighbour, “I wanted to know if I was really being watched…by something.” I know what he meant. There is a strange ghostly atmosphere – fed by gory tales, ghost sightings and dark history – that lingers even after re-entry into the modern world. The kids of course loved it…I mean we are talking ghosts here. We had promised our offspring a memorable stay to fortify ourselves for the driving days ahead and Hobart did not disappoint. Trainspotting is a favorite pastime for my boys and we finally find the one thing that rivets these two energetic giants of tiny attention spans into a full hour of sitting still – unheard of and unbelievable until that day. In an enormous room at Alpen Model Village and Railway (+61 (0)3 6249 3748), a model of the Swiss Alps rises into mountain peaks, crisscrossed by valleys and inhabited by villages and people. However, what grabs your attention are the trains. Sixteen model trains hurtle into dark tunnels bored into the mountains and rush out the other side, wind around villages, cross bridges and stop for a moment at train terminals, puffing and tooting. When the room darkens, heralding night, the train lights go on (as well as those in the tiny chalets and pricks of light adorn the miniature chairlifts) and as a storm hits, thunder rumbles and lightening flashes and through it all the trains pass each other taking tiny people around and into the alps. Then dawn breaks and the trains roll past glassy lakes where mists rise and the day lights the model world once again. Outside the room is a lovely fairy garden with surprises such as model houses and gnomes, but it’s the trains of the Swiss Alps that later we repeatedly talk about. Fresh from that wonder we join up with Hobart local Heather Henri of Let Us Show You Tasmania (+61 (0)3 6224 2782) a font of information about the island, who takes us to the place I was dreading the most – the Cadbury Chocolate Factory. The conveyor belts of shiny brown (and red, green, orange) shapes did, surprisingly, draw me into the Willy Wonka world of sugar and cocoa. So this is how they make these things…and there actually is cherry in Cherry Ripes…though not a lot. We walk out of there or rather, the kids full of sugar highs bounce out, smeared head to foot with chocolate samples. The sense of preservation is strong in Tassie and nowhere is this more obvious than at Fonthill, a property in the middle of the island and a great base for central regions. We stay in the original log cabin, which the first settler on the property built 170 years ago. Beautifully restored yet comfortable, offering porches with views across the gently sloping land, it has old pictures on the walls, a simple open fireplace and brass beds against rough wooden walls. Modern conveniences such as a stove and microwave, shower and bath didn’t take away a feeling that I was stepping back in history to a time of convict labor, pioneering settlers and colonial life. Up on the hill is the manor, still full of silver teapots and four-poster beds, which became the main house for the owners when they had amassed enough wealth to leave the cabin. Fonthill is still a working farm and the children had their first try at feeding orphan lambs from baby bottles and patting ponies. I sit on the back porch and contemplate the original settlers who lived rough; we can see how rough just by peering into the old wood-fed stove (opposite the new one) and feeling the old rustic implements hanging on the outside walls. I could forget about the Dow Jones Index and economic rationalizations affecting the health system and tap into a simpler time. Contentment descends and wraps me in an emerging sense of peace. We are on an island of excitement and learning, of tranquillity and history, of wilderness and civilization, soon to head north to explore wild and ancient landscapes – I love it. Getting to Tasmania from the USA is pretty straightforward. Families must fly to the Australian cities of Melbourne or Sydney and take a connecting domestic flight to Hobart, or overnight ferry to the north coast. Here, buses, shuttles and car hire is available. Taking ferries is the way to get around. The Spirit of Tasmania (+61 (0) 3 6421 7333) runs regular boats from Melbourne to Devonport on the north coast of Tasmania. If you prefer to fly, Qantas Airlines (888 256 1775 toll free within USA) flies one way from Melbourne to Hobart.